humility, and to His disciples, a way of living in the world. On Good Friday that “way” of Jesus is put on trial. The crowds taunt Him. His friends abandon Him. His “way” of peace, mercy, forgiveness seems a total failure on this day, as this good man is hung upon a cross to die. The kingdom of God as preached by Jesus seems nothing but a naïve dream. Darkness enters the land. We experience Good Friday in so many ways in our lives and world today: poison gas in Syria, dark and recurring rumors of Klan rallies in the South, or even the questions that so many people of good faith have about the presence, or absence, of God in their lives – why this illness in my life, why this loss, why doesn’t God answer my prayers? And then, on Saturday night, as darkness begins to fall and a faint glimmer of stars appears in the night sky, a crowd gathers in the memorial garden outside our church. A large fire is lit. 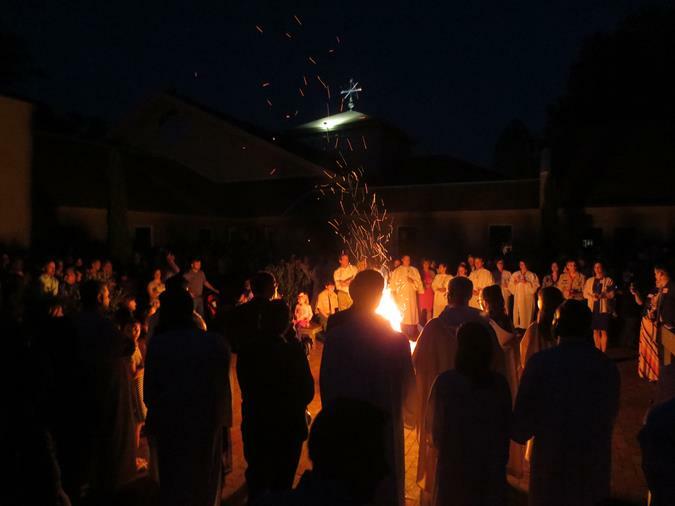 The Easter candle, a sign of the risen Christ, is lit from the fire, and as the procession of people begins to enter the church, hundreds of smaller candles are lit from the Easter candle, and the dark church is lit from within, lit by the people who each hold a single candle and light up the dark church. The effect is magnificent – the darkness of Good Friday, the fear of the disciples, all of it gives way to the proclamation that the tomb is not the end, that the darkness of this world gives way to the power of God to bring new life to what seemed empty. The disciples in last week’s gospel “saw and believed,” and this is our Easter faith, a powerful statement in a world that often seems without hope. Many thanks to all who helped serve our Easter liturgies last week. You may have noticed last week that our new signs have arrived – one on Leesville Road near the preschool and community center, and the other also on Leesville Road near the athletic fields. Many thanks to all who contributed to our 2015 year-end letter which requested funds for those signs.